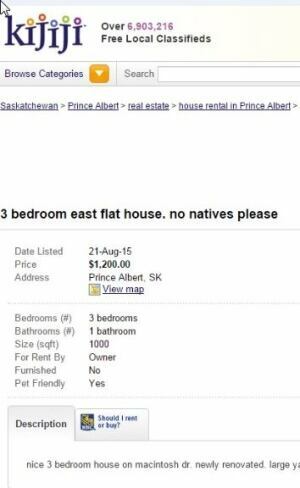 Newspaper Rock: Apartment ad: "No natives please"
Advertisement says that 'being funded or a stay at home mommy are not jobs'A Kijiji ad to rent a three-bedroom home in Prince Albert, Sask., has been pulled after complaints of racism. The title of the ad read, "3 bedroom east flat house, no natives please." The text of the ad said newcomers to Canada were welcome, "but aboriginals will not be considered." When Jeanne Labelle saw the ad, she was shocked and contacted Kijiji to complain. "I just find it so offensive that somebody would not be able to see deeper than their own prejudices," Labelle said. The ad, which was offering a 1,000-square-foot home for $1,200 per month, also insisted that renters be working and said that "being funded or a stay at home mommy are not jobs." Interim FSIN chief Kimberly Jonathan says the response has been 'heartwarming'"We face this and it's reality out there," said Jonathan. "A lot of times we just say, 'Well we're not going to say anything because where will my complaint go?'" Kijiji pulled the ad after a complaint. And there has been a torrent of feedback denouncing the ad. "If you look at the post and look at the social media, the comments ongoing, people are saying, our society is saying, 'This is not OK.'"
Jonathan said the reaction has been "heartwarming." Namerind Housing Corporation CEO says many aboriginal people face racism in pursuit of housingMany people have called a recent Prince Albert Kijiji advertisement racist and offensive, because its writer said they would not consider renting the home to aboriginal people. But the president and CEO of an aboriginal-owned housing company calls it a "timesaver." Robert Byers says many aboriginal people face racism when trying to find a rental home. "It's frustrating, but it's just something that happens all the time," he said.Comment: The stereotype here is that Indians are lazy, good-for-nothing bums who live on welfare. For more on Indian as welfare recipients, see Economist's Bogus "Sloth" Claim and Congressman Calls Indians "Wards of Government."